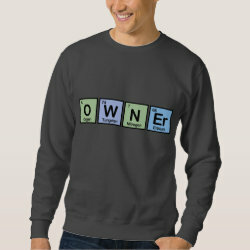 OMG .. the word OWNER is spelled out using elements of the periodic table. How cool is that? It reads: Oxygen + Tungsten + Nitrogen + More... Erbium = OWNEr This makes a funny and colorful design for anyone that owns a pet, their own business or home, or anything else ... especially if they also love chemistry or science!